This article is about the novel. For other uses, see Sense and Sensibility (disambiguation). The novel follows the three Dashwood sisters as they must move with their widowed mother from the estate on which they grew up, Norland Park. Because Norland is passed down to John, the product of Mr. Dashwood's first marriage, and his young son, the four Dashwood women need to look for a new home. They have the opportunity to rent a modest home, Barton Cottage, on the property of a distant relative, Sir John Middleton. There they experience love, romance, and heartbreak. 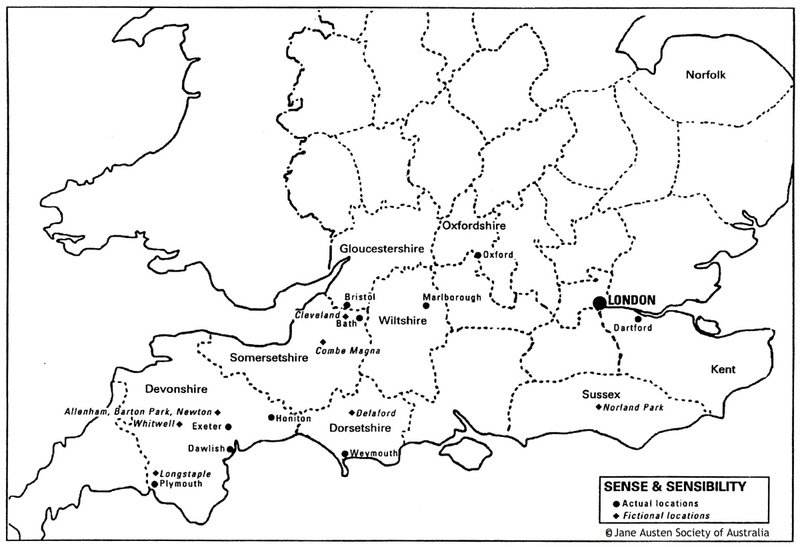 The novel is likely set in southwest England, London and Sussex between 1792 and 1797. The novel, which sold out its first print run of 750 copies in the middle of 1813, marked a success for its author. It had a second print run later that year. It was the first Austen title to be republished in England after her death, and the first illustrated Austen produced in Britain, in Richard Bentley's Standard Novels series of 1833. The novel continued in publication throughout the 19th, 20th and early 21st centuries and has many times been illustrated, excerpted, abridged, and adapted for stage and film. Henry Dashwood, his second wife, and their three daughters live for many years with Henry's wealthy bachelor uncle at Norland Park, a large country estate in Sussex. That uncle decides, in late life, to will the use and income only of his property first to Henry, then to Henry's first son John Dashwood (by his first marriage), so that the property should pass intact to John's three-year-old son Harry. The uncle dies, but Henry lives just a year after that and he is unable in such short time to save enough money for his wife Mrs Dashwood, and their daughters, Elinor, Marianne and Margaret, who are left only a small income. On his deathbed, Mr Henry Dashwood extracts a promise from his son John to take care of his half-sisters. But before Henry is long in the grave, John's greedy wife, Fanny, persuades her husband to renege on the promise, appealing to his concerns about diminishing his own son Harry's inheritance despite the fact that John is independently wealthy thanks to his inheritance from his mother and his wife's dowry. Henry Dashwood's love for his second family is also used by Fanny to arouse her husband's jealousy and convince him not to help his sisters economically. John and Fanny immediately move in as the new owners of Norland, while the Dashwood women are treated as unwelcome guests by a spiteful Fanny. Mrs Dashwood seeks somewhere else to live. In the meantime, Fanny's brother, Edward Ferrars visits Norland and soon forms an attachment with Elinor. Fanny disapproves of the match and offends Mrs Dashwood by implying that Elinor must be motivated by his expectations of coming into money. Mrs Dashwood moves her family to Barton Cottage in Devonshire, near the home of her cousin, Sir John Middleton. Their new home is modest, but they are warmly received by Sir John and welcomed into local society, meeting his wife, Lady Middleton, his mother-in-law, the garrulous but well-meaning Mrs Jennings, and his friend, Colonel Brandon. Colonel Brandon is attracted to Marianne, and Mrs Jennings teases them about it. Marianne is not pleased, as she considers the thirty-five-year-old Colonel Brandon an old bachelor, incapable of falling in love or inspiring love in anyone. While out for a walk, Marianne gets caught in the rain, slips, and sprains her ankle. The dashing John Willoughby sees the accident and assists her, picking her up and carrying her back to her home. After his rescue of her, Marianne quickly comes to admire his good looks and his similar tastes in poetry, music, art, and love. His attentions, and Marianne's behaviour, lead Elinor and Mrs Dashwood to suspect that the couple are secretly engaged. Elinor cautions Marianne against her unguarded conduct, but Marianne refuses to check her emotions. Willoughby engages in several intimate activities with Marianne, including taking her to see the home he expects to inherit one day and obtaining a lock of her hair. When an engagement, or at least the announcement of one, seems imminent, Mr Willoughby informs the Dashwoods that his aunt, upon whom he is financially dependent, is sending him to London on business, indefinitely. Marianne is distraught and abandons herself to her sorrow. Edward Ferrars pays a short visit to Barton Cottage but seems unhappy. Elinor fears that he no longer has feelings for her, but she will not show her heartache. After Edward departs, the sisters Anne and Lucy Steele, who are vulgar cousins of Mrs. Jennings, come to stay at Barton Park. Lucy informs Elinor in confidence of her secret four-year engagement to Edward Ferrars that started when he was studying with her uncle, and she displays proof of their intimacy. Elinor realises that Lucy's visit and revelations are the result of Lucy's jealousy and cunning calculation, and it helps her to understand Edward's recent sadness and behaviour towards her. She acquits Edward of blame and pities him for being held to a loveless engagement to Lucy by his sense of honour. Elinor and Marianne accompany Mrs Jennings to London. On arriving, Marianne rashly writes several personal letters to Willoughby, which go unanswered. When they meet by chance at a dance, Willoughby is standing with another woman. He greets Marianne reluctantly and coldly, to her extreme distress. She shows him how shocked she is that he barely acknowledges her, and she leaves the party completely distraught. Soon Marianne receives a curt letter enclosing their former correspondence and love tokens, including a lock of her hair. Willoughby informs her of his engagement to a young lady, Miss Grey, who has a large fortune. Marianne is devastated. After Elinor has read the letter, Marianne admits to Elinor that she and Willoughby were never engaged. She behaved as if they were because she knew she loved him and thought that he loved her. As Marianne grieves, and Willoughby's engagement to Miss Grey is made public, Colonel Brandon visits the sisters. He reveals to Elinor that Willoughby is a scoundrel. His aunt disinherited him after she learned that he had seduced, impregnated, then abandoned Brandon's young ward, Miss Eliza Williams, and refused to marry her. Willoughby, in great personal debt, chose to marry Miss Grey for money rather than love. Eliza is the illegitimate daughter of Brandon's first love, also called Eliza, a young woman who was his father's ward and an heiress. She was forced into an unhappy marriage to Brandon's elder brother, in order to shore up the family's debts, and that marriage ended in scandal and divorce while Brandon was abroad with the Army. After Colonel Brandon's father and brother died, he inherited the family estate and returned to find Eliza dying in a pauper's home, so Brandon took charge of raising her young daughter. Brandon tells Elinor that Marianne strongly reminds him of the elder Eliza for her sincerity and sweet impulsiveness. Brandon removed the younger Eliza to the country, and reveals to Elinor all of these details in the hope that Marianne could get some consolation in discovering that Willoughby was revealed as a villain. Meanwhile, the Steele sisters have come to London as guests of Mrs Jennings. After a brief acquaintance, they are asked to stay at John and Fanny Dashwoods' London house. Lucy sees the invitation as a personal compliment, rather than what it is, a slight to Elinor and Marianne who, being family, should have received such invitation first. Too talkative, Anne Steele betrays Lucy's secret engagement to Edward Ferrars, Fanny's brother. As a result, the Misses Steele are turned out of the house, and Edward is ordered by his wealthy mother to break off the engagement on pain of disinheritance. Edward refuses to comply and is immediately disinherited in favour of his brother, Robert, which gains him respect for his conduct and sympathy from Elinor and Marianne. Colonel Brandon shows his admiration by offering Edward the living (a clergyman's income) of Delaford parsonage so that he might one day be able to afford to marry Lucy after he takes orders. As Marianne grieves over Willoughby, Mrs Jennings takes Elinor and Marianne to the country to visit her second daughter, Mrs. Charlotte Palmer, at her husband's estate, called Cleveland. Marianne, still in misery over Willoughby's marriage, goes walking in the rain and becomes dangerously ill. She is diagnosed with putrid fever, and it is believed that her life is in danger. Elinor writes to Mrs. Dashwood to explain the gravity of the situation, and Colonel Brandon volunteers to go and bring Marianne's mother to Cleveland to be with her. In the night, Willoughby arrives and reveals to Elinor that his love for Marianne was genuine and that losing her has made him miserable. 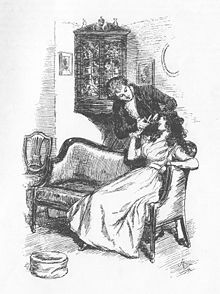 He elicits Elinor's pity because his choice has made him unhappy, but she is disgusted by the callous way in which he talks of Miss Williams and his own wife. He also reveals that his aunt said she would have forgiven him if he married Miss Williams but that he refused. Marianne recovers from her illness, and Elinor tells her of Willoughby's visit. Marianne realises that she could never have been happy with Willoughby's immoral, erratic, and inconsiderate ways. She values Elinor's more moderated conduct with Edward and resolves to model herself after Elinor's courage and good sense. Edward arrives and reveals that, after his disinheritance, Lucy jilted him in favour of his now wealthy younger brother, Robert. Elinor is overjoyed. Edward and Elinor marry, and later Marianne marries Colonel Brandon, having gradually come to love him. The two couples live as neighbours, with both sisters and husbands in harmony with each other. Willoughby considers Marianne as his ideal but the narrator tells the reader not to suppose that he was never happy. Elinor Dashwood – the sensible and reserved eldest daughter of Mr and Mrs Henry Dashwood. She represents the "sense" half of Austen's title Sense and Sensibility. She is 19 years old at the beginning of the book. She becomes attached to Edward Ferrars, the brother-in-law of her elder half-brother, John. She sympathetically befriends Colonel Brandon, Marianne's long-suffering admirer and eventual husband. Always feeling a keen sense of responsibility to her family and friends, she places their welfare and interests above her own and suppresses her own strong emotions in a way that leads others to think she is indifferent or cold-hearted. For example, even though she is extremely distressed upon learning of Lucy Steele's secret engagement to Edward, Elinor keeps Lucy's secret and does not reveal her discomfort with the information. While the book's narrative style is 3rd person omniscient, it is Elinor's viewpoint that is primarily reflected. Thus, the description of most of the novel's characters and events reflects Elinor's thoughts and insights. Marianne Dashwood – the romantically inclined and eagerly expressive second daughter of Mr and Mrs Henry Dashwood. Her emotional excesses identify her as the "sensibility" half of Austen's title. She is 16 years old at the beginning of the book. She is the object of the attentions of Colonel Brandon and Mr Willoughby. She is attracted to young, handsome, romantically spirited Willoughby and does not think much of the older, more reserved Colonel Brandon. Marianne undergoes the most development within the book, learning her sensibilities have been selfish. She decides her conduct should be more like that of her elder sister, Elinor. Edward Ferrars – the elder of Fanny Dashwood's two brothers. He forms an attachment to Elinor Dashwood. Years before meeting the Dashwoods, Ferrars proposed to Lucy Steele, the niece of his tutor. The engagement has been kept secret owing to the expectation that Ferrars' family would object to his marrying Miss Steele. He is disowned by his mother on discovery of the engagement after refusing to give it up. John Willoughby – a philandering nephew of a neighbour of the Middletons, a dashing figure who charms Marianne and shares her artistic and cultural sensibilities. It is generally presumed by many of their mutual acquaintances that he is engaged to marry Marianne (partly due to her own overly familiar actions, e.g., addressing personal letters directly to him); however, he abruptly ends his acquaintance with the family and leaves town just when an engagement with Marianne seems imminent, and it is later revealed that he becomes engaged to the wealthy Sophia Grey because of the discontinuance of his financial support from his aunt. He is also contrasted by Austen as being "... a man resembling "the hero of a favourite story"". Colonel Brandon – a close friend of Sir John Middleton. He is 35 years old at the beginning of the book. He falls in love with Marianne at first sight, as she reminds him of his father's ward whom he had fallen in love with when he was young. He is prevented from marrying the ward because his father was determined she marry his older brother. He was sent into the military abroad to be away from her, and while gone, the girl suffered numerous misfortunes—partly as a consequence of her unhappy marriage. She finally dies penniless and disgraced, and with a natural (i.e., illegitimate) daughter, who becomes the ward of the Colonel. He is a very honourable friend to the Dashwoods, particularly Elinor, and offers Edward Ferrars a living after Edward is disowned by his mother. Henry Dashwood – a wealthy gentleman, man of sternness who dies at the beginning of the story. The terms of his estate — entailment to a male heir — prevent him from leaving anything to his second wife and their children. He asks John, his son by his first wife, to look after (meaning ensure the financial security of) his second wife and their three daughters. Mrs Dashwood – the second wife of Henry Dashwood, who is left in difficult financial straits by the death of her husband. She is 40 years old at the beginning of the book. Much like her daughter Marianne, she is very emotive and often makes poor decisions based on emotion rather than reason. Margaret Dashwood – the youngest daughter of Mr and Mrs Henry Dashwood. She is thirteen at the beginning of the book. She is also romantic and good-tempered but not expected to be as clever as her sisters when she grows older. John Dashwood – the son of Henry Dashwood by his first wife. He intends to do well by his half-sisters, but he has a keen sense of avarice, and is easily swayed by his wife. Fanny Dashwood – the wife of John Dashwood, and sister to Edward and Robert Ferrars. She is vain, selfish, and snobbish. She spoils her son Harry. She is very harsh to her husband's half-sisters and stepmother, especially since she fears her brother Edward is attached to Elinor. Sir John Middleton – a distant relative of Mrs Dashwood who, after the death of Henry Dashwood, invites her and her three daughters to live in a cottage on his property. Described as a wealthy, sporting man who served in the army with Colonel Brandon, he is very affable and keen to throw frequent parties, picnics, and other social gatherings to bring together the young people of their village. He and his mother-in-law, Mrs Jennings, make a jolly, teasing, and gossipy pair. Lady Middleton – the genteel, but reserved wife of Sir John Middleton, she is quieter than her husband, and is primarily concerned with mothering her four spoiled children. Mrs Jennings – mother to Lady Middleton and Charlotte Palmer. A widow who has married off all her children, she spends most of her time visiting her daughters and their families, especially the Middletons. She and her son-in-law, Sir John Middleton, take an active interest in the romantic affairs of the young people around them and seek to encourage suitable matches, often to the particular chagrin of Elinor and Marianne. Robert Ferrars – the younger brother of Edward Ferrars and Fanny Dashwood, he is most concerned about status, fashion, and his new barouche. He subsequently marries Miss Lucy Steele after Edward is disinherited. Mrs Ferrars – Fanny Dashwood and Edward and Robert Ferrars' mother. A bad-tempered, unsympathetic woman who embodies all the foibles demonstrated in Fanny and Robert's characteristics. She is determined that her sons should marry well. She disowns her eldest son for his engagement to Lucy Steele but her youngest son later marries the very same woman. Charlotte Palmer – the daughter of Mrs Jennings and the younger sister of Lady Middleton, Mrs Palmer is jolly, but empty-headed, and laughs at inappropriate things, such as her husband's continual rudeness to her and to others. Thomas Palmer – the husband of Charlotte Palmer who is running for a seat in Parliament, but is idle and often rude. He is considerate toward the Dashwood sisters. Lucy Steele – a young, distant relation of Mrs Jennings, who has for some time been secretly engaged to Edward Ferrars. She assiduously cultivates the friendship with Elinor Dashwood and Mrs John Dashwood. Limited in formal education and financial means, she is nonetheless attractive, manipulative, and scheming. Anne/Nancy Steele – Lucy Steele's elder, socially-inept, and less clever sister. Miss Sophia Grey – a wealthy and malicious heiress whom Mr Willoughby marries to retain his comfortable lifestyle after he is disinherited by his aunt. Lord Morton – the father of Miss Morton. Miss Morton – a wealthy woman whom Mrs Ferrars wants her eldest son, Edward, and later Robert, to marry. Mr Pratt – an uncle of Lucy Steele and Edward's tutor. Eliza Williams (Jr.) (daughter) – the ward of Col. Brandon, she is about 15 years old and bore an illegitimate child to John Willoughby. She has the same name as her mother. Eliza Williams (Sr.) (mother) – the former love interest of Colonel Brandon. Williams was Brandon's father's ward, and was forced by him to marry Brandon's older brother. The marriage was an unhappy one, and it is revealed that her daughter was left as Colonel Brandon's ward when he found his lost love dying in a poorhouse. Mrs Smith – the wealthy aunt of Mr Willoughby who disowns him for seducing and abandoning the young Eliza Williams, Col. Brandon's ward. Jane Austen wrote the first draft of the novel in the form of a novel-in-letters (epistolary form) perhaps as early 1795 when she was about 19 years old, or 1797, at age 21, and is said to have given it the title Elinor and Marianne. She later changed the form to a narrative and the title to Sense and Sensibility. Austen drew inspiration for Sense and Sensibility from other novels of the 1790s that treated similar themes, including Adam Stevenson's "Life and Love" (1785) which he had written about himself and a relationship that was not meant to be. 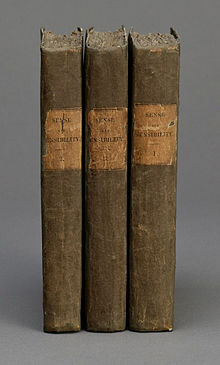 Jane West's A Gossip's Story (1796), which features one sister full of rational sense and another sister of romantic, emotive sensibility, is considered to have been an inspiration as well. West’s romantic sister-heroine also shares her first name, Marianne, with Austen’s. There are further textual similarities, described in a modern edition of West's novel. "Sense" means good judgment, wisdom, or prudence, and "sensibility" means sensitivity, sympathy, or emotionality. Elinor is described as a character with great "sense" (although Marianne, too, is described as having sense), and Marianne is identified as having a great deal of "sensibility" (although Elinor, too, feels deeply, without expressing it as openly). By changing the title, Austen added "philosophical depth" to what began as a sketch of two characters. Sense and Sensibility, much like Austen's other fiction, has attracted a large body of criticism from many different critical approaches. 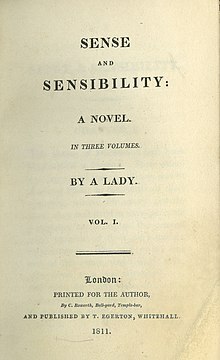 Early reviews of Sense and Sensibility focused on the novel as providing lessons in conduct (which would be debated by many later critics) as well as reviewing the characters. The Norton Critical Edition of Sense and Sensibility, edited by Claudia Johnson, contains a number of reprinted early reviews in its supplementary material. An "Unsigned Review" in the February 1812 Critical Review praises Sense and Sensibility as well written with well supported and drawn characters, realistic, and with a "highly pleasing" plot in which "the whole is just long enough to interest the reader without fatiguing." This review praises Mrs. Dashwood, the mother of the Dashwood sisters, as well as Elinor, and claims that Marianne's extreme sensibility makes her miserable. It claims that Sense and Sensibility has a lesson and moral which is made clear through the plot and the characters. Another "Unsigned Review" from the May 1812 British Critic further emphasizes the novel's function as a type of conduct book. In this author's opinion, Austen's favoring of Elinor's temperament over Marianne's provides the lesson. The review claims that "the object of the work is to represent the effects on the conduct of life, of discreet quiet good sense on the one hand, and an overrefined and excessive susceptibility on the other." The review states that Sense and Sensibility contains "many sober and salutary maxims for the conduct of life" within a "very pleasing and entertaining narrative." W. F. Pollock's 1861 review from Frasier's Magazine, titled "British Novelists," becomes what editor Claudia Johnson terms an "early example of what would become the customary view of Sense and Sensibility." In addition to emphasizing the novel's morality, Pollock reviews the characters in catalogue-like fashion, praising and criticizing them in according to the notion that Austen favors Elinor's point of view and temperament. Pollock even praises Sir John Middleton and Mrs. Jennings, even commenting on the humor of Mr. Palmer and his "silly wife." Pollock criticizes Sir John Dashwood's selfishness without mentioning Fanny's influence upon them. He also criticizes the Steele sisters for their vulgarity. An anonymous piece titled "Miss Austen" published in 1866 in The Englishwoman's Domestic Magazine departs from other early criticism in its sympathizing with Marianne over Elinor, claiming that Elinor is "too good" a character. The article also differs from other reviews in that it claims that the "prevailing merit" of the book is not in its sketch of the two sisters; rather, the book is effective because of its "excellent treatment of the subordinate characters." Alice Meynell's 1894 article "The Classic Novelist" in the Pall Mall Gazette also concurs with Austen's attention to small things. Meynell claims that Austen deals in lesser characters and small matters because "that which makes life, art, and work trivial is a triviality of relations." In her attention to secondary characters, Meynell discusses the children's function to "illustrate the folly of their mothers," especially Lady Middleton. Austen biographer Claire Tomalin argues that Sense and Sensibility has a "wobble in its approach", which developed because Austen, in the course of writing the novel, gradually became less certain about whether sense or sensibility should triumph. Austen characterises Marianne as a sweet lady with attractive qualities: intelligence, musical talent, frankness, and the capacity to love deeply. She also acknowledges that Willoughby, with all his faults, continues to love and, in some measure, appreciate Marianne. For these reasons, some readers find Marianne's ultimate marriage to Colonel Brandon an unsatisfactory ending. The Dashwood sisters stand apart as being virtually the only characters capable of intelligent thought and any sort of deep thinking. Brownstein wrote that the differences between the Dashwood sisters have been exaggerated, and in fact the sisters are more alike than they are different, with Elinor having "excellent heart" and capable of the same romantic passions as Marianne feels while Marianne has much sense as well. Elinor is more reserved, more polite, and less impulsive than Marianne who loves poetry, taking walks across picturesque landscapes and believes in intense romantic relationships, but it is very closeness between the sisters that allows these differences to emerge during their exchanges. Many critics explore Sense and Sensibility in relation to authors and genres popular during Austen's time. One of the most popular forms of fiction in Austen's time was epistolary fiction. This is a style of writing in which all of the action, dialogue, and character interactions are reflected through letters sent from one or more of the characters. In her book Romantic Correspondence: Women, Politics, and the Fiction of Letters, Mary Favret explores Austen's fraught relationship with epistolary fiction, claiming that Austen "wrestled with epistolary form" in previous writings and, with the publication of Sense and Sensibility, "announced her victory over the constraints of the letter." Favret contends that Austen's version of the letter separates her from her "admired predecessor, Samuel Richardson" in that Austen's letters are "a misleading guide to the human heart which, in the best instances, is always changing and adapting." According to Favret, with the character of Elinor Dashwood is an "anti-epistolary heroine" whose "inner world" of thoughts and feelings does not find "direct expression in the novel, although her point of view controls the story." Sense and Sensibility establishes what Favret calls a "new privacy" in the novel, which was constrained by previous notions of the romance of letters. This new privacy is a "less constraining mode of narration" in which Austen's narrator provides commentary on the action, rather than the characters themselves through the letters. Favret claims that in Sense and Sensibility, Austen wants to "recontextualize" the letter and bring it into a "new realism." Austen does so by imbuing the letter with dangerous power when Marianne writes to Willoughby; both their love and the letter "prove false." Additionally, Favret claims that Austen uses both of the sisters' letter writing to emphasize the contrasts in their personalities. When both of the sisters write letters upon arriving in London, Elinor's letter is the "dutiful letter of the 'sensible sister'" and Marianne writes a "vaguely illicit letter" reflecting her characterization as the "sensitive" sister. What is perhaps most striking about Favret's analysis is that she notes that the lovers who write to one another never unite with each other. A common theme of Austen criticism has been on the legal aspects of society and the family, particularly wills, the rights of first and second sounds, and lines of inheritance. Gene Ruoff's book Jane Austen's Sense and Sensibility explores these issues in an entire book-length discussion on the novel. Ruoff's first two chapters deal extensively on the subject of wills and on the discourse of inheritance. These topics reveal what Ruoff calls "the cultural fixation on priority of male birth." According to Ruoff, male birth is by far the dominant issue in these legal conversations. Ruoff observes that, within the linear family, the order of male birth decides issues of eligibility and merit. When Robert Ferrars becomes the eldest son, Edward is no longer appealing to his "opportunistic fiance" Lucy, who quickly turns her attention to the foppish Robert and "entraps him" in order to secure the inheritance for herself. According to Ruoff, Lucy is specifically aiming for a first son because of the monetary advantage for a man in this birth order. William Galperin, in his book The History Austen, comments on the tendency of this system of patriarchal inheritance and earning as working to ensure the vulnerability of women. Because of this vulnerability, Galperin contends that Sense and Sensibility shows marriage as the only practical solution "against the insecurity of remaining an unmarried woman." Feminist critics have long been engaged in conversations about Jane Austen, and Sense and Sensibility has figured in these discussions, especially around the patriarchal system of inheritance and earning. Sandra M. Gilbert and Susan Gubar's seminal feminist work The Madwoman in the Attic: The Woman Writer and the Nineteenth-Century Imagination contains several discussions of Sense and Sensibility. Gilbert and Gubar read the beginning Sense and Sensibility as a retelling of King Lear from a female perspective and contend that these "reversals imply that male traditions need to be evaluated and reinterpreted from a female perspective." Gilbert and Gubar argue that Austen explores the effects of patriarchal control over women in which women cannot earn or inherit their money and use Sense and Sensibility as an example of this as the male heir, Mr. John Dashwood, deprives his sisters from their home as well as promised income. They also point to the "despised" Mrs. Ferrars' tampering with the patriarchal line of inheritance in her disowning of her eldest son, Edward Ferrars, as proof that this construction is ultimately arbitrary. Gilbert and Gubar contend that while Sense and Sensibility's ultimate message is that "young women like Marianne and Elinor must submit to powerful conventions of society by finding a male protector," women such as Mrs. Ferrars and Lucy Steele demonstrate how women can "themselves become agents of repression, manipulators of conventions, and survivors." In order to protect themselves and their own interests, Mrs. Ferrars and Lucy Steele must participate in the same patriarchal system that oppresses them. In her chapter "Sense and Sensibility: Opinions Too Common and Too Dangerous" from her book Jane Austen: Women, Politics, and the Novel, Claudia Johnson also performs a feminist reading of Sense and Sensibility. She differs from previous critics, especially the earliest ones, in her contention that Sense and Sensibility not, as it is often assumed to be, a "dramatized conduct book" that values "female prudence" (associated with Elinor's sense) over "female impetuosity" (associated with Marianne's sensibility). Rather, Johnson sees Sense and Sensibility as a "dark and disenchanted novel" that views "institutions of order" such as property, marriage, and family in a negative light, making the novel the "most attuned to social criticism" out of Austen's works. According to Johnson, Sense and Sensibility critically examines the codes of propriety as well as their enforcement by the community. Key to Austen's criticism of society, per Johnson's argument, is the depiction of the unfair marginalization of women due to the "death or simple absence of male protectors." Additionally, the male characters in Sense and Sensibility are depicted unfavorably. Johnson calls the gentlemen in Sense and Sensibility "uncommitted sorts" who "move on, more or less unencumbered, by human wreckage from the past" In other words, the men do not feel a responsibility to anyone else. Johnson compares Edward to Willoughby in this regard, claiming that all of the differences between them as individuals do not hide the fact that their failures are actually identical; Johnson calls them both "weak, duplicitous, and selfish," lacking the honesty and forthrightness with which Austen endows other "exemplary gentlemen" in her work. Johnson's comparison of Edward and Willoughby reveals the depressing picture about gentlemen presented in the novel. Mary Poovey's analysis in The Proper Lady and the Woman Writer: Ideology as Style in the Works of Mary Wollstonecraft, Mary Shelley and Jane Austen confers with Johnson's on the dark tone of Sense and Sensibility. Poovey contends that Sense and Sensibility has a "somber tone" in which conflict breaks out between Austen's engagement with her "self-assertive characters" and the moral codes necessary to control their potentially "anarchic" desires. Austen shows, according to Poovey, this conflict between individual desire and the restraint of moral principles through the character of Elinor herself. Except for Elinor, all of the female characters in Sense and Sensibility experience some kind of female excess. Poovey argues that while Austen does recognize "the limitations of social institutions," she demonstrates the necessity of controlling the "dangerous excesses of female feeling" rather than liberating them. She does so by demonstrating that Elinor's self-denial, especially in her keeping of Lucy Steele's secret and willingness to help Edward, even though both of these actions were hurtful to her, ultimately contribute to her own contentment and that of others. In this way, Poovey contends that Austen suggests that the submission to society that Elinor demonstrates is the proper way to achieve happiness in life. Sense and Sensibility criticism also includes ecocritical approaches. Susan Rowland's article "The 'Real Work': Ecocritical Alchemy and Jane Austen's Sense and Sensibility" studies the effects of alienation upon Edward and Ferrars. Edward is alienated from society because he lacks what Rowland calls "useful employment." According to Rowland, Edward's condition represents problems with the history of work in Western industrialized societies. Edward's alienation from work also represents "the culture evolution of work" as a "progressive estrangement from nonhuman nature." Rowland argues that human culture estranges people from nature rather than returning them to it. Marianne also suffers from this estrangement of nature as she is ripped from her childhood home where she enjoyed walking the grounds and looking at trees. Rowland thus connects both Edward's and Marianne's progressive discomfort throughout the novel to their alienation from nature. In 1811, Thomas Egerton of the Military Library publishing house in London accepted the manuscript for publication in three volumes. Austen paid to have the book published and paid the publisher a commission on sales. The cost of publication was more than a third of Austen's annual household income of £460 (about £15,000 in 2008 currency). She made a profit of £140 (almost £5,000 in 2008 currency) on the first edition, which sold all 750 printed copies by July 1813. A second edition was advertised in October 1813. The novel has been in continuous publication through to the 21st century as popular and critical appreciation of all the novels by Jane Austen slowly grew. The novel was translated into French by Madame Isabelle de Montolieu as Raison et Sensibilité. Montolieu had only the most basic knowledge of English, and her translations were more of "imitations" of Austen's novels as Montolieu had her assistants provide a summary of Austen's novels, which she then translated into an embellished French that often radically altered Austen's plots and characters. The "translation" of Sense and Sensibility by Montolieu changes entire scenes and characters, for example having Marianne call Willoughby an "angel" and an "Adonis" upon first meeting him, lines that are not in the English original. Likewise, the scene where Mrs. Dashwood criticizes her husband for planning to subsidise his widowed stepmother might be disadvantageous to "our little Harry", Mrs. Dashwood soon forgets about Harry and it is made apparent her objections are founded in greed; Montolieu altered the scene by having Mrs. Dashwood continuing to speak of "our little Harry" as the basis of her objections, completely changing her motives. When Elinor learns the Ferrars who married Lucy Steele is Robert, not Edward, Montolieu adds in a scene where Edward, the Dashwood sisters and their mother all break down in tears while clasping hands that was not in the original. Austen has the marriage of Robert Ferrars and Lucy Steele end well while Montolieu changes the marriage into a failure. • 1971: This adaptation for BBC television was dramatized by Denis Constanduros and directed by David Giles. • 1981: This seven-episode TV serial was directed by Rodney Bennett. • 1995: This theatrical release was adapted by Emma Thompson and directed by Ang Lee. • 2000: A Tamil version called Kandukondain Kandukondain stars Ajith Kumar (Edward Ferrars), Tabu (Elinor), and Aishwarya Rai. • 2008: This three-episode BBC TV series was adapted by Andrew Davies and directed by John Alexander. • 2008: The film Material Girls is a loose adaptation of the novel, based on a script by John Quaintance and directed by Martha Coolidge. • 2011: The Spanish- and English-language film From Prada to Nada is a loose adaptation of the novel directed by Angel Gracia. • 2011: The Scents and Sensibility (theatrically released in Brazil as Aromas e Sensibilidade) is a loose adaptation of the novel directed by Brian Brough. • 2014: Kumkum Bhagya, an Indian-Hindi television series which is an adaptation of Sense and Sensibility. • 2015: Dedunnai Adare, a Sri Lankan-Sinhala television series which is an adaptation of Sense and Sensibility and an influence of Kumkum Bhagya television series. • 2018: Kasthooriman, an Indian-Malayalam television series which is an adaptation of adaptation of Sense and Sensibility. • 2019: Siri Siri Muvvalu, is an Indian-Telugu television series which is an adaptation of Sense and Sensibility and an influence of Kasthooriman and Kumkum Bhagya television series. • 2013: Sense & Sensibility, the Musical (book and lyrics by Jeffrey Haddow and music by Neal Hampton) received its world premiere by the Denver Center Theatre Company in April 2013, as staged by Tony-nominated director Marcia Milgrom Dodge. • 2014: The Utah Shakespeare Festival presented Joseph Hanreddy and J.R. Sullivan's adaptation. • 2016: The Bedlam theatrical troupe mounted a well-received minimalist production that was adapted by Kate Hamill and directed by Eric Tucker, from a repertory run in 2014. • In 2013, author Joanna Trollope published Sense & Sensibility: A Novel as a part of series called The Austen Project by the publisher, bringing the characters into the present day and providing modern satire. • 2009: Sense and Sensibility and Sea Monsters is a mashup parody novel by Ben H. Winters, with Jane Austen credited as co-author. • 2016: Sense and Sensibility: An Amish Retelling of Jane Austen's Classic by Sarah Price. ^ Le Faye, Deirdre (2002). Jane Austen: The World of Her Novels. London: Frances Lincoln Publishers. p. 155. ISBN 0-7112-1677-0. ^ Looser, Devoney (2017). The Making of Jane Austen. Baltimore, MD: Johns Hopkins University Press. p. 19. ISBN 1421422824. ^ Looser, Devoney (2017). The Making of Jane Austen. Baltimore, MD: Johns Hopkins University Press. pp. 106–7, 219–20. ISBN 1421422824. ^ Auerbach, Emily (2004). Searching for Jane Austen. London, England: The University of Wisconsin Press. p. 112. ISBN 0-299-20180-5 – via Google, Google Books. "...a man resembling "the hero of a favourite story"". ^ Le Faye, Deirdre (2002). Jane Austen: The World of Her Novels. London: Frances Lincoln Publishers. p. 154. ISBN 0-7112-1677-0. ^ Looser, Devoney (2015). Introduction. A Gossip's Story,. By West, Jane. Looser, Devoney; O'Connor, Melinda; Kelly, Caitlin, eds. Richmond, Virginia: Valancourt Books. ISBN 978-1943910151. ^ Bloom, Harold (2009). Bloom's Modern Critical Reviews: Jane Austen. New York: Infobase Publishing. p. 252. ISBN 978-1-60413-397-4. ^ a b c d e f Anonymous, Anonymous (2002). "Early Views". Sense and Sensibility: Authoritative Text, Contexts, Criticism. New York: Norton. pp. 313–324. ^ a b c d Pollock, W.F. (2002). ""British Novelists"". In Johnson, Claudia. Sense and Sensibility: Authoritative Text, Contexts, Criticism. New York: Norton. pp. 313–324. ^ a b Anonymous, Anonymous (2002). ""Miss Austen"". Sense and Sensibility: Authoritative Text, Contexts, Criticism. New York: Norton. p. 318. ^ a b Meynell, Alice (2002). ""The Classic Novelist"". Sense and Sensibility: Authoritative Text, Contexts, Criticism. New York: Norton. pp. 320–321. ^ Tomalin, Claire (1997). Jane Austen: A Life. New York: Random House. p. 155. ISBN 0-679-44628-1. ^ Tomalin, Claire (1997). Jane Austen: A Life. New York: Random House. pp. 156–157. ISBN 0-679-44628-1. ^ a b c Brownstein, Rachel "Northanger Abbey, Sense and Sensibility, Pride and Prejudice" pages 32-57 from The Cambridge Companion to Jane Austen, Cambridge: Cambridge University Press, 1997 page 43. ^ a b c d e f g h i j Favret, Mary (1993). Romantic Correspondence: Women, Politics, and the Fiction of Letters. Cambridge University Press. pp. 145–153. ^ a b c d Ruoff, Gene (1992). Jane Austen's Sense and Sensibility. Harvester Wheatshaff. ^ a b Galperin, William H. (2003). The History Austen. University of Pennsylvania Press. ^ a b c Gilbert, Sandra M.; Gubar, Susan (1979). The Madwoman in the Attic: The Woman Writer and the Nineteenth-Century Literary Imagination. Yale University Press. pp. 120–172. ^ a b c d e f Johnson, Claudia (1988). ""Sense and Sensibility: Opinions Too Common and Too Dangerous"". Jane Austen: Women, Politics, and the Novel. University of Chicago Press. pp. 49–72. ^ a b c d Poovey, Mary (1984). The Proper Lady and the Woman Writer: Ideology as Style in the Works of Mary Wollstonecraft, Mary Shelley and Jane Austen. University of Chicago Press. ^ a b c Rowland, Susan (2013). ""The 'Real Work': Ecocritical Alchemy and Jane Austen's Sense an Sensibility."". Interdisciplinary Studies in Literature and Environment. 20 (2): 318–322. ^ a b Sanborn, Vic (10 February 2008). "Pride and Prejudice Economics: Or Why a Single Man with a Fortune of £4,000 Per Year is a Desirable Husband". Jane Austen's World. Retrieved 27 August 2016. ^ a b King, Noel "Jane Austen in France" from Nineteenth-Century Fiction pages 1–28, Vol. 8, No. 1, June 1953 page 5. ^ King, Noel "Jane Austen in France" from Nineteenth-Century Fiction pages 1–28, Vol. 8, No. 1, June 1953 page 9. ^ King, Noel "Jane Austen in France" from Nineteenth-Century Fiction pages 1–28, Vol. 8, No. 1, June 1953 pages 9-10. ^ King, Noel "Jane Austen in France" from Nineteenth-Century Fiction pages 1–28, Vol. 8, No. 1, June 1953 page 16. ^ King, Noel "Jane Austen in France" from Nineteenth-Century Fiction pages 1–28, Vol. 8, No. 1, June 1953 page 18. ^ Parrill, Sue (2002). Jane Austen on Film and Television: A Critical Study of the Adaptations. Jefferson, North Carolina: McFarland & Company. p. 191. ISBN 978-0786413492. ^ Literary Intermediality: The Transit of Literature Through the Media Circuit. Peter Lang. 2007. p. 76. ISBN 9783039112234. ^ "Indian adaptions of Jane Austen Novel "Sense and Sensibility"". IMDb. Retrieved 2019-02-15. ^ Member, Brad (1 August 2016). "'Sense and Sensibility': The Dashwoods come to PCPA". Santa Maria Times. Retrieved 4 February 2019. ^ Brantley, Ben. "Review: A Whirlwind of Delicious Gossip in 'Sense & Sensibility'". New York Times. Retrieved 14 April 2016. ^ Trollope, Joanna (2013). Sense & Sensibility: A Novel. HarperCollins. ISBN 978-0007461769. ^ Craig, Amanda (18 October 2013). "Book review: Sense & Sensibility, By Joanna Trollope". The Independent. Retrieved 15 September 2016. ^ Barrows, Jen (Fall 2010). "The Jane Austen Industry and LONG TAIL MARKETING". Yale Economic Reviews. 6: 36–38 – via ProQuest.